Comments concerning the detection of threats based on radioactive material Dr. Rick B. Spielman ABQ Technologies, Inc. Albuquerque, NM 87123. 2 What is wrong with this account? What is very good with this account? Weapons-Grade Uranium Seized in Bulgaria -- In May 1999, Bulgarian customs officials at the Ruse border crossing in Bulgaria discovered 10 grams of highly enriched uranium ( 235 U) inside a lead "pig" concealed in an air compressor in the trunk of a car. The 35- year-old Turkish driver was transporting his nuclear cargo from Turkey to Moldova. It is believed the smuggler was offering this small shipment of 235 U as a "sample" to buyers in Moldova in advance of a larger shipment of the same materials. 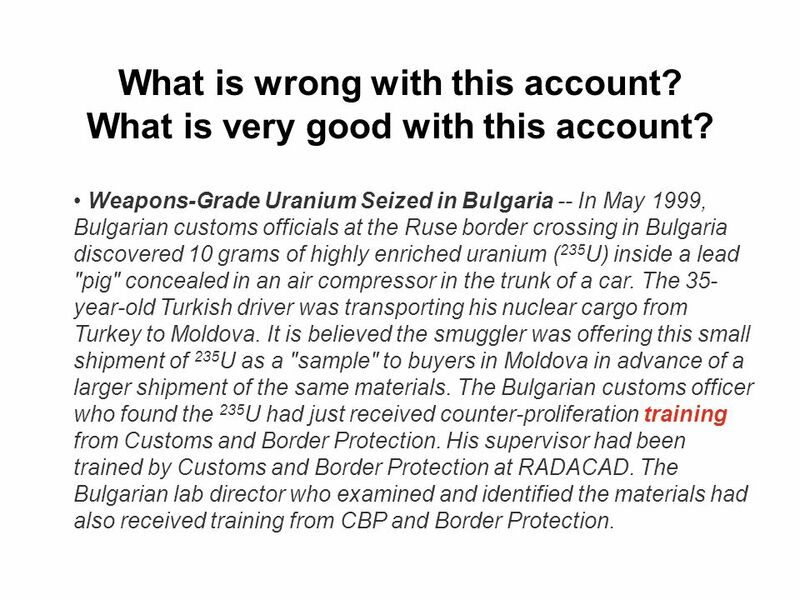 The Bulgarian customs officer who found the 235 U had just received counter-proliferation training from Customs and Border Protection. His supervisor had been trained by Customs and Border Protection at RADACAD. The Bulgarian lab director who examined and identified the materials had also received training from CBP and Border Protection. 3 What are the limitations of existing detector systems? 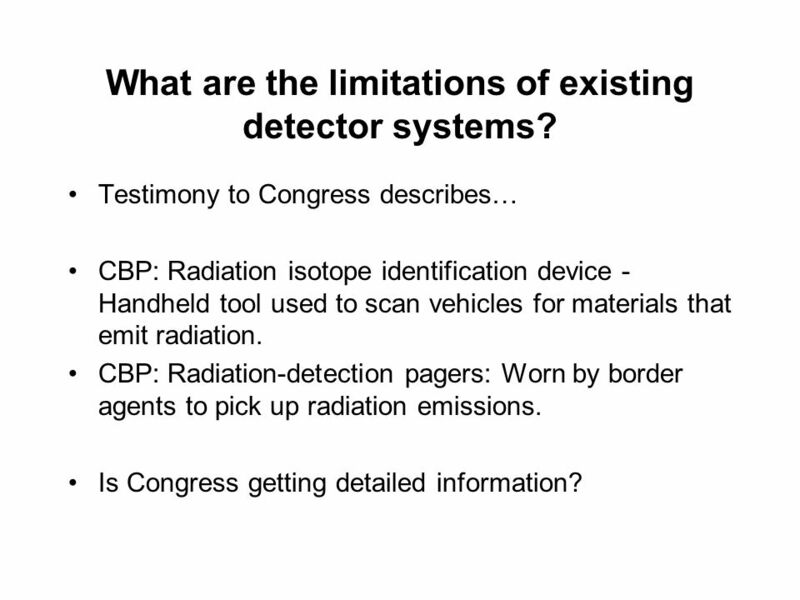 Testimony to Congress describes… CBP: Radiation isotope identification device - Handheld tool used to scan vehicles for materials that emit radiation. CBP: Radiation-detection pagers: Worn by border agents to pick up radiation emissions. Is Congress getting detailed information? 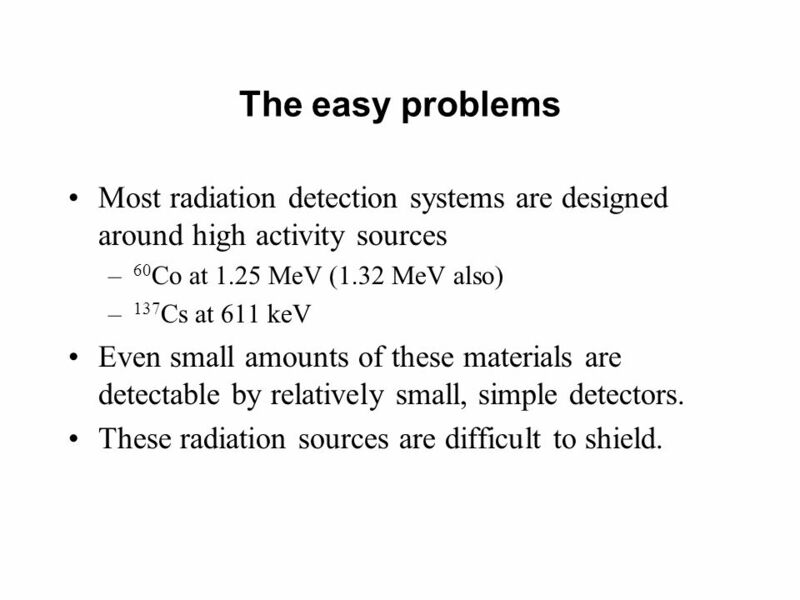 4 The easy problems Most radiation detection systems are designed around high activity sources – 60 Co at 1.25 MeV (1.32 MeV also) – 137 Cs at 611 keV Even small amounts of these materials are detectable by relatively small, simple detectors. 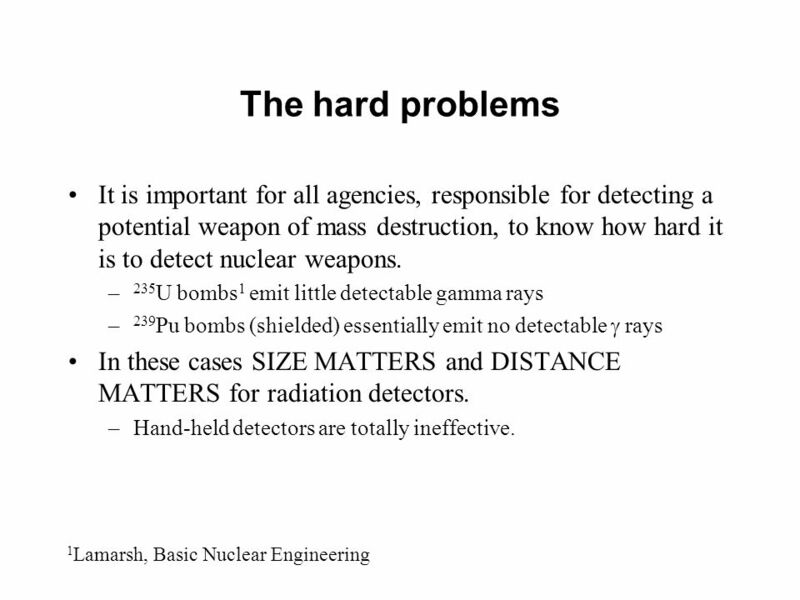 These radiation sources are difficult to shield. 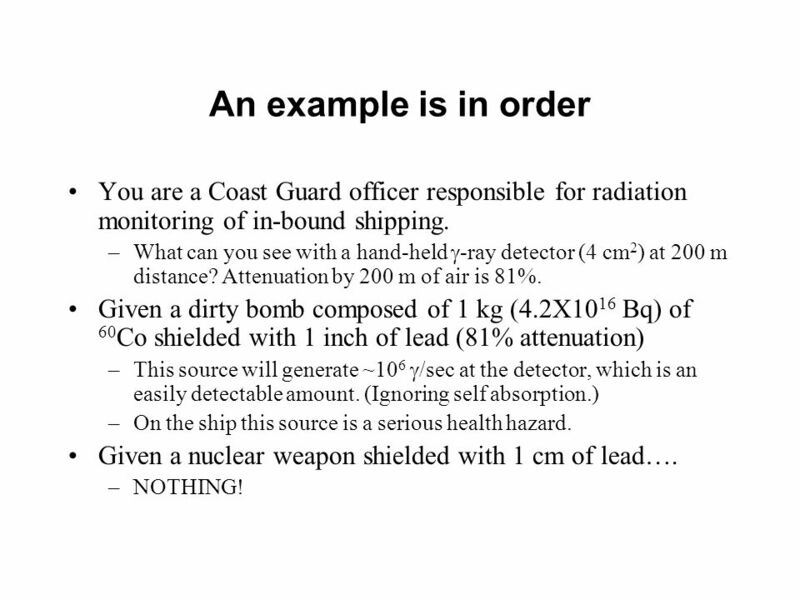 6 An example is in order You are a Coast Guard officer responsible for radiation monitoring of in-bound shipping. –What can you see with a hand-held -ray detector (4 cm 2 ) at 200 m distance? Attenuation by 200 m of air is 81%. Given a dirty bomb composed of 1 kg (4.2X10 16 Bq) of 60 Co shielded with 1 inch of lead (81% attenuation) –This source will generate ~10 6 /sec at the detector, which is an easily detectable amount. (Ignoring self absorption.) –On the ship this source is a serious health hazard. Given a nuclear weapon shielded with 1 cm of lead…. –NOTHING! 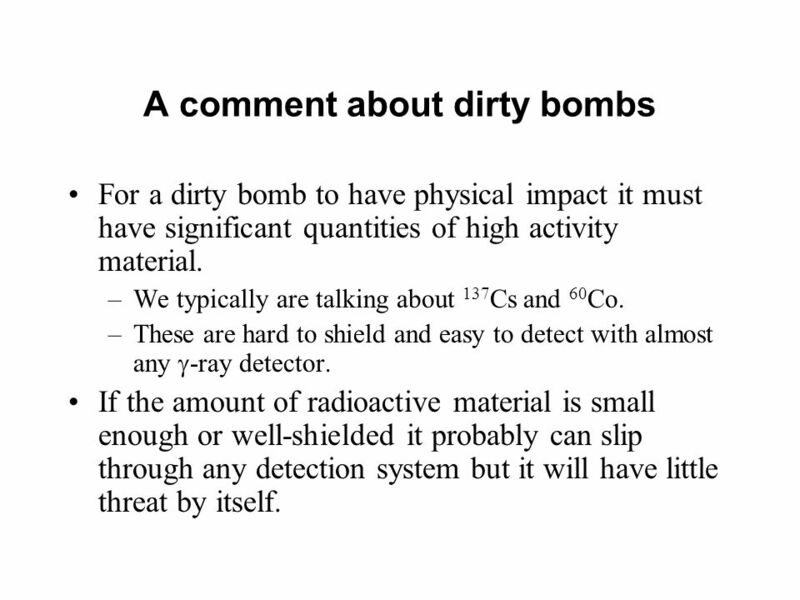 7 A comment about dirty bombs For a dirty bomb to have physical impact it must have significant quantities of high activity material. –We typically are talking about 137 Cs and 60 Co. –These are hard to shield and easy to detect with almost any -ray detector. If the amount of radioactive material is small enough or well-shielded it probably can slip through any detection system but it will have little threat by itself. 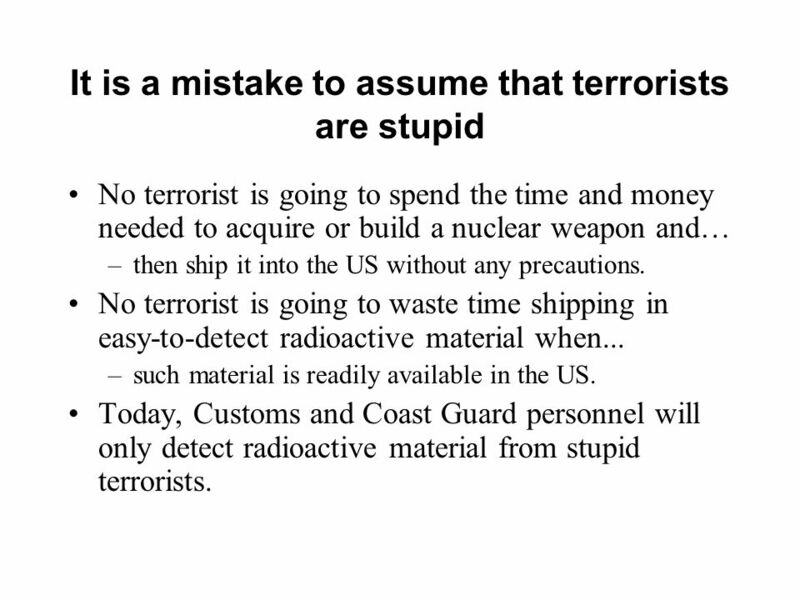 8 It is a mistake to assume that terrorists are stupid No terrorist is going to spend the time and money needed to acquire or build a nuclear weapon and… –then ship it into the US without any precautions. No terrorist is going to waste time shipping in easy-to-detect radioactive material when... –such material is readily available in the US. Today, Customs and Coast Guard personnel will only detect radioactive material from stupid terrorists. 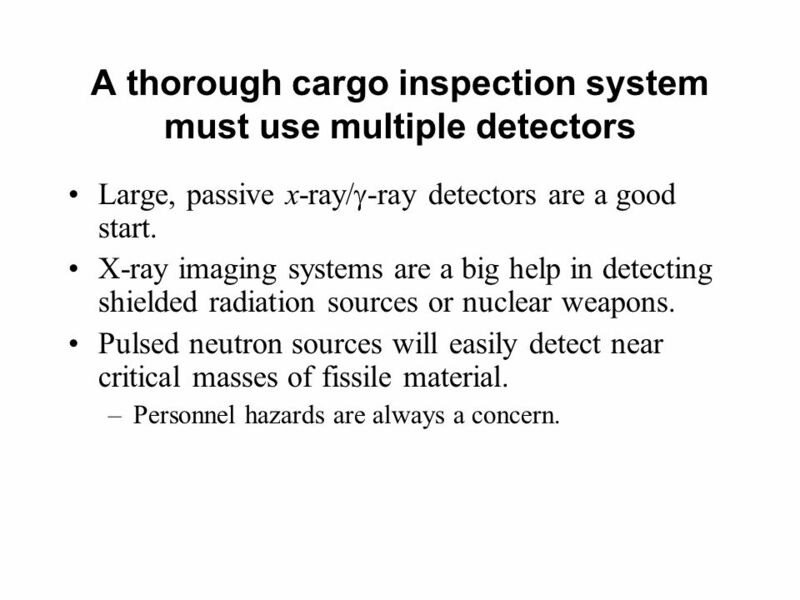 9 A thorough cargo inspection system must use multiple detectors Large, passive x-ray/ -ray detectors are a good start. X-ray imaging systems are a big help in detecting shielded radiation sources or nuclear weapons. Pulsed neutron sources will easily detect near critical masses of fissile material. –Personnel hazards are always a concern. 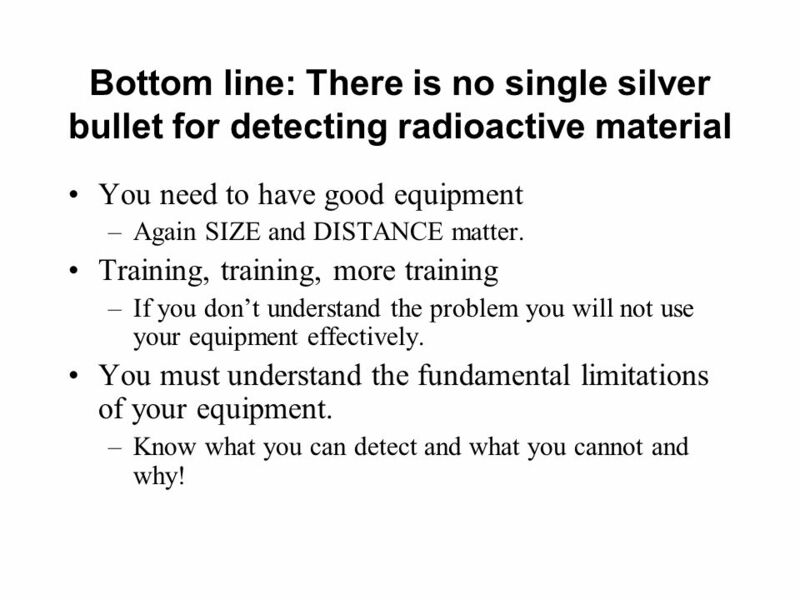 10 Bottom line: There is no single silver bullet for detecting radioactive material You need to have good equipment –Again SIZE and DISTANCE matter. Training, training, more training –If you dont understand the problem you will not use your equipment effectively. You must understand the fundamental limitations of your equipment. –Know what you can detect and what you cannot and why! 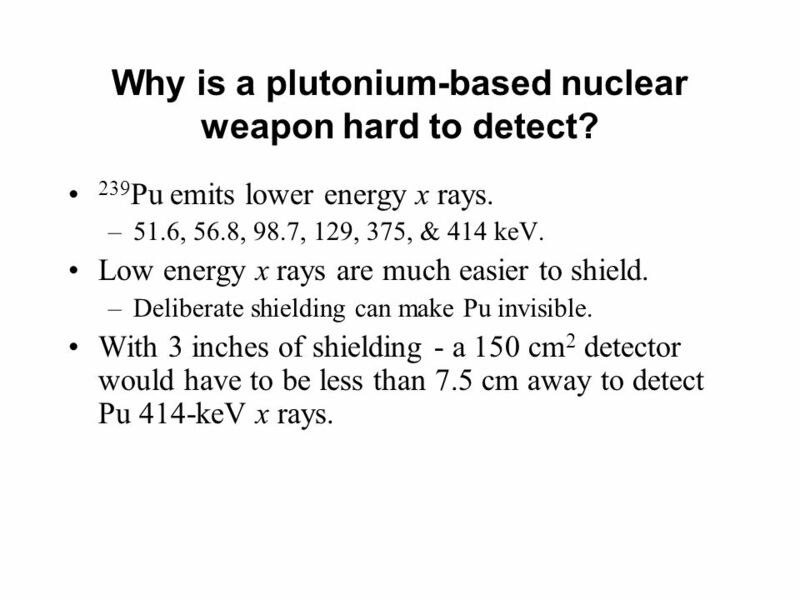 12 Why is a plutonium-based nuclear weapon hard to detect? 239 Pu emits lower energy x rays. –51.6, 56.8, 98.7, 129, 375, & 414 keV. Low energy x rays are much easier to shield. –Deliberate shielding can make Pu invisible. With 3 inches of shielding - a 150 cm 2 detector would have to be less than 7.5 cm away to detect Pu 414-keV x rays. 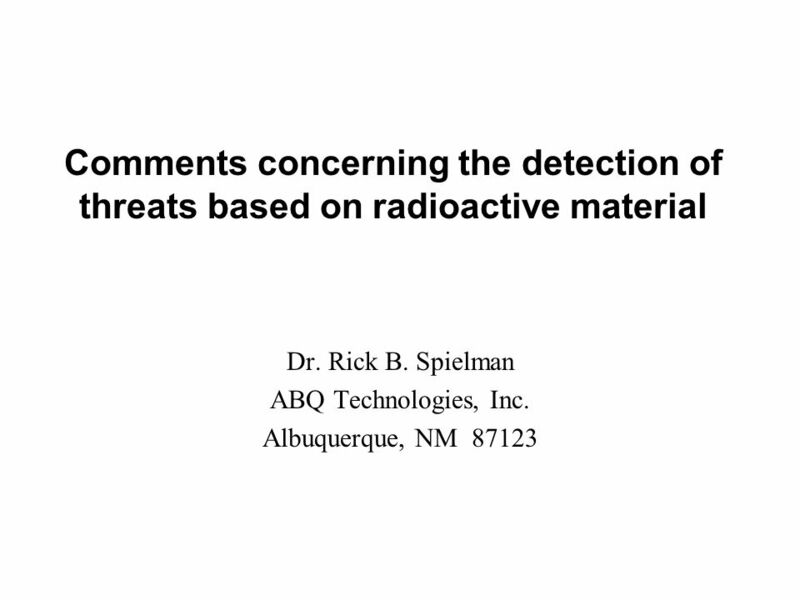 Download ppt "Comments concerning the detection of threats based on radioactive material Dr. Rick B. Spielman ABQ Technologies, Inc. Albuquerque, NM 87123." Radiological and Nuclear Threats Robert Hillaire, Ph.D., PE ME Exploratory Systems Technologies Department Sandia National Laboratories, Livermore. Do now! Can you write the title Radioactivity in your books? Nuclear Terrorism Identification, Primary Response, Effects. Nuclear Physics AP Physics B. 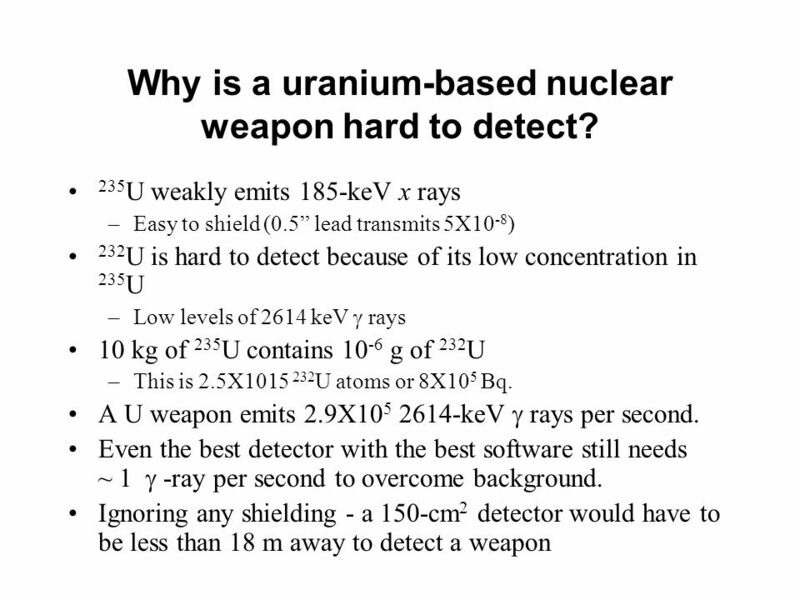 Nuclear Physics - Radioactivity Before we begin to discuss the specifics of radioactive decay we need to be certain you. Lesson 3: Nuclear Basics Dr. Andrew Ketsdever. Nuclear Reactor. A2 Physics - L.O. Jones 2007 – Information gathered from Wikipedia Critical Mass. 1 Introduction USG – 573 RMDS - Radioactive Material Detector System. What nuclides made that electromagnetic radiation? How nuclear scientists identify nuclides in a sample. APS1 Application of Nuclear Forensics. APS2 Bulgarian border crossing case The Bulgarian border patrol then found a lead container hidden inside a portable. MAXWELL SECURITY AUTHORITY. THE THREAT: The TERROR PLOT of AL QAEDA. AMOLE Radioactivity. Science Park HS -- Honors Chemistry Early Pioneers in Radioactivity Roentgen: Discoverer of X- rays 1895 Becquerel: Discoverer of. NUCLEAR ENERGY: FISSION CONVERSION OF MASS TO ENERGY = mc 2.